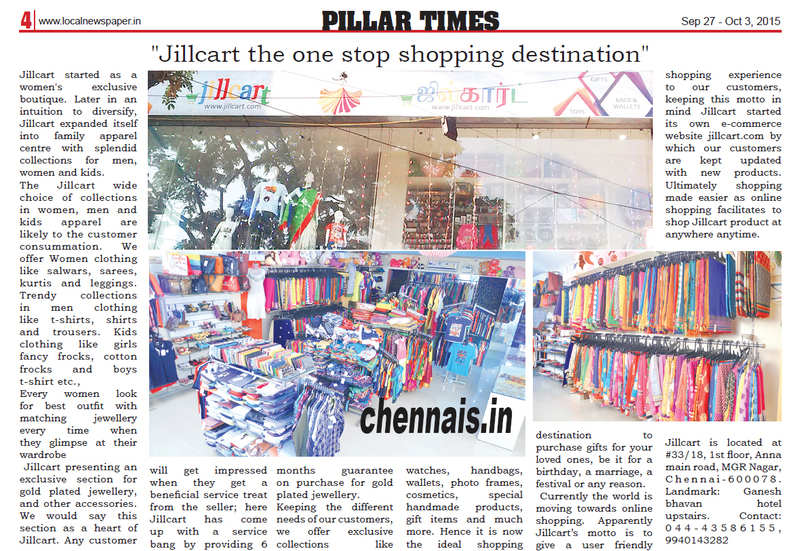 Jillcart started as a women’s exclusive boutique. Later in an intuition to diversify, Jillcart expanded itself into family apparel centre with splendid collections for men, women and kids. Every women look for best outfit with matching jewellery every time when they glimpse at their wardrobe. Jillcart presenting an exclusive section for gold plated jewellery, and other accessories. We would say this section as a heart of Jillcart. Any customer will get impressed when they get a beneficial service treat from the seller; here Jillcart has come up with a service bang by providing 6 months guarantee on purchase for gold plated jewellery. Keeping the different needs of our customers, we offer exclusive collections like watches, handbags, wallets, photo frames, cosmetics, special handmade products, gift items and much more. Hence it is now the ideal shopping destination to purchase gifts for your loved ones, be it for a birthday, a marriage, a festival or any reason. Currently the world is moving towards online shopping. Apparently Jillcart’s motto is to give a user friendly shopping experience to our customers, keeping this motto in mind Jillcart started its own e-commerce website jillcart.com by which our customers are kept updated with new products. Ultimately shopping made easier as online shopping facilitates to shop Jillcart product at anywhere anytime.